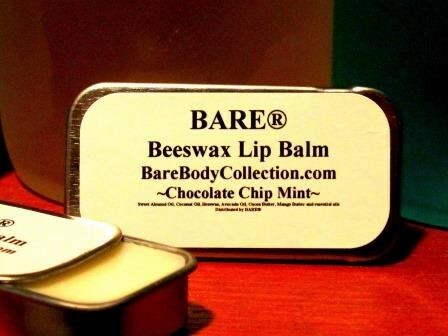 Bare LIP BOOSTER Hot Chocolate Chip Mint goes on moist and keeps your lips feeling great. It's a non-caloric and guilt free chocolate fix! with a little sting of pepper. Yes, pepper...for centuries and known the world over as being an aphrodisiac and stimulant! It also helps to dilate the blood vessels in your lips. The dilation of the blood vessels in your lips is what makes them look fuller, as well as gives them a nice color. The unique formula prevents your lipstick from running into those tiny lines around your lips. Wear it with your favorite lipstick or without! With store bought lip balm you continuously have to keep applying the lip balm - this is typically due to the fact that most lip balms are made with petroleum based products versus beeswax which keeps lips moisturized. Castor Seed Oil, Beeswax, Lauryl Laurate, Carnauba and Soy Wax, Chocolate, Vanilla, Mint and Pepper.